Commentary track by director John Boorman. Concept Art and Pressbook Galleries. John Boorman has directed some of the most interesting films of the last half century. "Point Blank" was a ballsy, down and dirty crime drama far superior to the wimpy Mel Gibson remake, "Payback." "Excaliber" is the screens best adaptation of the King Arthur legend. "Deliverance" is one of the best films ever made. Even when Mr. Boorman misses the bull's eye, as in "The Emerald Forrest" and "Zardoz" he still delivers thought provoking and enjoyable films. Set toward the end of the 23rd century, "Zardoz" is Mr. Boorman's personal musings on what might happen to human beings if they created a utopian society in which death is taken out of the equation. The Eternals are a group of people who live in the Vortex, a self contained and created prison in which all the knowledge of our race is contained. They are unable to die, even if they want to. Outside the vortex, life goes on with all the brutality and hardship that we face today. A stone God (Zardoz) floats through the sky and visits his chosen people, the Exterminators. The Exterminators are told by their God that the gun is good, it brings death. The Exterminators take the guns provided by Zardoz and kill everyone they can catch. 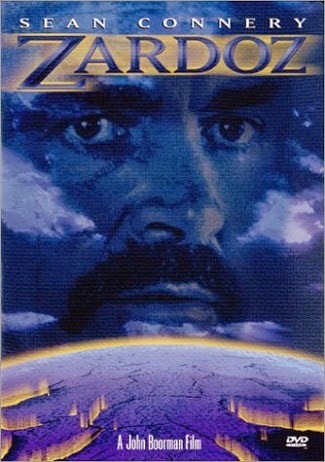 Zed (Sean Connery) enters the stone head and is then able to enter the Vortex. His presence causes great debate among those who live their. Is Zed a harbinger of doom or a savior come to free those trapped in a hell of their own creation? Rent the movie to find out. The picture and sound are very good. There are not a lot of extras, but the commentary track by Mr. Boorman is priceless. Fans of films from the 70s will want to own this DVD. The photography, and in-camera special effects of cinematographer Geoffrey Unsworth are excellent. Fox did a nice job in this transfer. The flesh tones (and there is a lot of flesh) are excellent. This is a visually exciting film. There are brilliant sets that combine the past and future. Enjoy. Mr. Boorman used Beethoven's 7th symphony as the thematic base for the films soundtrack. It is a great piece of music. Hear it in all its glory. Easy to navigate. Not very imaginative though. The film is visually exciting, but the menu is not. The trailer for this movie is wild. It took back to the day. While there are not many extras, the commentary track is excellent. For insight into pre-Jaws, blockbuster filmmaking, listen to this track. I found it amazing that "Zardoz" had a budget of $1 million. It looks to be a much more expensive film. Also interesting are the revelations concerning the films special effects. This was before CGI. All of the film's special effects were in-camera. This is amazing. Watch the film and you will see what I mean. "Zardoz" was one of my favorite films in high school. Watch this movie and you might get some idea just what I was doing back then. It is a wild movie. While it may seem dated at times, "Zardoz" tries to explore some philosophical issues which you don't see in theatrical movies today. If the ladies are excited about seeing a muscular Sean Connery in a red loin cloth and leather boots then this is the movie for you.